Coonoor, Neilgherries [Nilgiris, Tamil Nadu]. bl.uk > Online Gallery Home	> Online exhibitions	> Asia, Pacific and Africa Collections	> Coonoor, Neilgherries [Nilgiris, Tamil Nadu]. This print was taken in the 1860s to form part of an album entitled 'Photographs of India and Overland Route'. 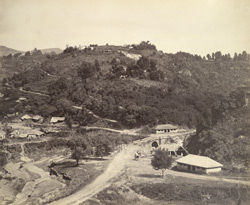 It shows a general view of Coonoor, a tea plantation town in Tamil Nadu not far from the former British summer capital of Ootacamund. Such hill stations in Kerala and Tamil Nadu became the favoured summer retreats of the British in south India during the nineteenth century because of their cool climate away from the heat of the plains. The major attraction of Coonoor is Sim's Park. Founded in the mid-nineteenth century, it was planted with various species of botanical interest including tree-ferns, giant rhododenrons and three hundred varieties of roses.